Moss & Barnett is pleased to announce that for the fourth consecutive year it has been named a “Best Law Firm” by U.S. News – Best Lawyers® for 2014. Firms included in the 2014 “Best Law Firms” list are recognized for professional excellence with persistently impressive ratings from clients and peers. Ranked firms, presented in tiers, are listed on a national and/or metropolitan scale. Receiving a tier designation reflects the high level of respect a firm has earned among other leading lawyers and clients in the same communities and the same practice areas for their abilities, their professionalism, and their integrity. The 2014 rankings are based on the highest number of participating firms and the highest number of client ballots on record. Over 12,000 attorneys provided over 330,000 law firm assessments, and almost 7,000 clients provided close to 20,000 evaluations. In addition, to provide personal insight, a new Law Firm Leaders Survey was implemented in the decision making process. “The ranking of Moss & Barnett as a ‘Best Law Firm’ by U.S. News – Best Lawyers® for 2014 is a tribute to all of our professionals and dedicated staff,” says Moss & Barnett President and Chief Executive Officer, Thomas J. Shroyer. 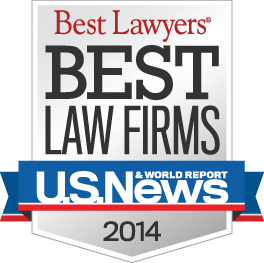 The U.S. News – Best Lawyers® “Best Law Firms” rankings are based on a rigorous process that includes the collection of client and lawyer evaluations, peer review from leading attorneys in their field, and review of additional information provided by law firms as part of the formal submission process. To be eligible for a ranking, a law firm must have at least one lawyer listed in the 19th edition of The Best Lawyers in America® list for that particular location and specialty. The U.S. News & World Report is a multi-platform digital publisher of news and analysis, which includes the digital only U.S. News Weekly magazine. Focusing on Health, Personal Finance, Education, Travel, Cars, and Public Service/Opinion, U.S. News has earned a reputation as the leading provider of service news and information that improves the quality of life of its readers. U.S. News & World Report’s signature franchises includes its News You Can Use® brand of journalism and its “Best” series of consumer web guides and publications that include rankings of colleges, graduate schools, hospitals, mutual funds, health plans, and more.